Karen Meyer, executive director of community Support Center (CSC) took a moment to explain CSC’s mission to prevent homelessness by providing short-term financial assistance and ongoing counseling. 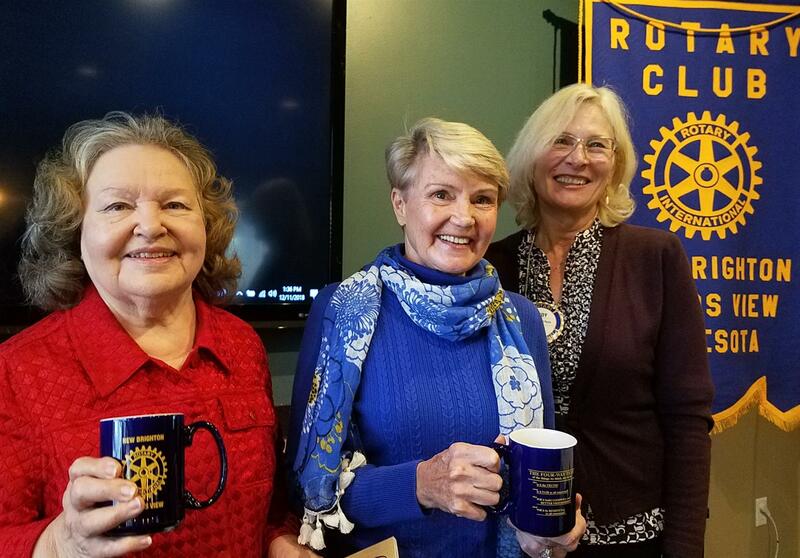 She invited us to attend their “Sing for Your Neighbors” benefit concert on January 27th, 2PM at Abiding Savior Lutheran Church, 8211 Red Oak Drive in Mounds View. This concert features several choirs from local area churches which support CSC. NBMV Rotarian and CSC Board member, Paul Fournier, is shown below presenting our $1,000 donation to Karen. Dennis Connolly reviewed the proposed changes to our Club Bylaws. Check your recent emails for a draft of the new bylaws and come prepared to vote on them at next week’s noon meeting (December 18th). Cindy noted that Life Prep Academy has added some new services for high school teens. They have added drop in hours from 3-7Pm on Monday –Friday and overnight emergency shelter services to reach out to even more teens experiencing homelessness. Volunteers/Donations are always needed so if you’d like to help, click here for more information. 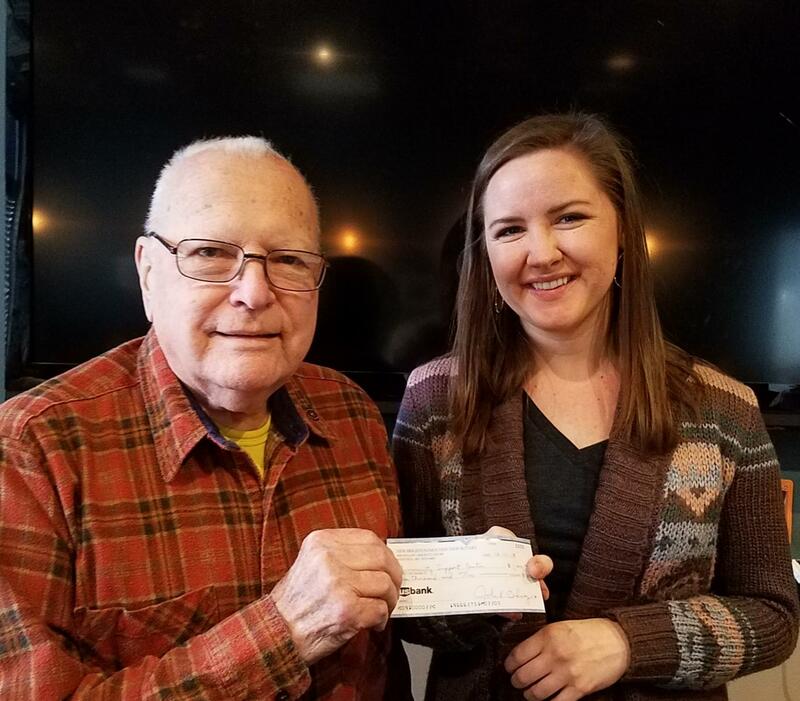 Cindy also made us aware that the deadline is December 14th to take advantage of the dollar for dollar match provided by Bell Lumber and Pole for new or increased contributions to the Food Shelf. Make checks payable to the Ralph Reeder Food Shelf and drop them off at the Food Shelf or get them to Cindy by the 13th. Many of you have already heard of the passing of former NBMV Rotarian Char Samuelson. Visitor Bob Benke said that the Memorial Service will be on Jan 5th, 11AM, at Salem Covenant Church. Gerry Tietz requested that each of us respond to his request to update our Clubrunner profiles before December 31. Just follow the link in his recent email. It’s time to think about ticket sales for the Gold Plate Dinner. Garry Johnson, Michelle Caron, Dave Hoel and Nicole Ulrich have been designated as Team Captains and their teams will be published soon. Our annual Irondale Choir concert and carol sing-along is next Tuesday, December 18th, at Risdall Advertising, 2685 Long Lake Road, Roseville. Don't miss it! Mark Beisswenger introduced our speakers, Soile Anderson and Eleanor Ostman. Soile grew up in Finland and, after losing her father in WWII, learned from her mother how to cook and care for her 3 younger siblings. She learned so well that, in her early 20’s, she bought and successfully operated a restaurant and later ran a 140 room hotel. She was intrigued the American fast food trend and came to the U.S to find out more about it. She worked at Perkins at first, and soon found herself working at the other end of the spectrum at the Anchorage restaurant. She started the Art Deco Restaurant in the Minnesota Museum of Art and shortly thereafter established Deco Catering. When the Museum was sold in 1992, Soile closed the restaurant but continued the Deco catering business. About that same time she started Taste of Scandinavia bakeries, specializing in Northern European baked goods. Taste of Scandinavia eventually grew to 5 locations and was sold in 2005 so she could focus on her catering business. Deco Catering has become the premier Kosher caterer in the Twin Cities and Jewish clients compose 80% of her business. Soile has now sold Deco catering and is concentrating on writing books (with co-speaker and author Eleanor Ostman) and giving cooking lessons. Eleanor, Soile and Cindy are pictured below.